First of all place the dried shiitake mushrooms in a bowl, with almost boiling water to cover for 1 hour. Blanch spinach for two minutes, place it in iced water and drain well. Separate whites and yolks. Blend egg yolks with spinach. Add 1 tbsp of mascarpone cheese and all flour to the mix. Now blend egg whites with a dash of salt and carefully combine egg yolks and egg whites mixes together. Cover a baking tray with baking paper and carefully transfer the egg mix on it, spreading evenly. Place the tray into an pre-heated to 190C(375F) oven and bake for 15 minutes. Peel and slice onions pole-to-pole. Drain mushrooms and cut into rough chunks. Fry onions on medium-low heat for 5 minutes, add mushrooms and fry for 5 more minutes on medium heat. Let a mushroom mix to cool a little and add sour cream, salt and pepper to it. Mix the mixture well. Take the baking pan out of the oven and evenly cover the spinach mixture with grated Parmesan cheese. Cover it with another sheet of baking paper and put on a working surface upside down. 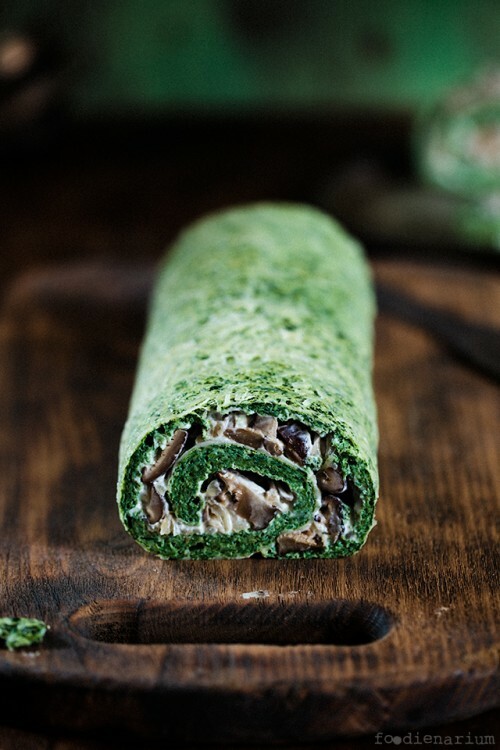 Cover the spinach sheet with mascarpone and transfer the mushroom mixture on it, spreading evenly. Roll it up and place in a fridge for at least an hour or two.